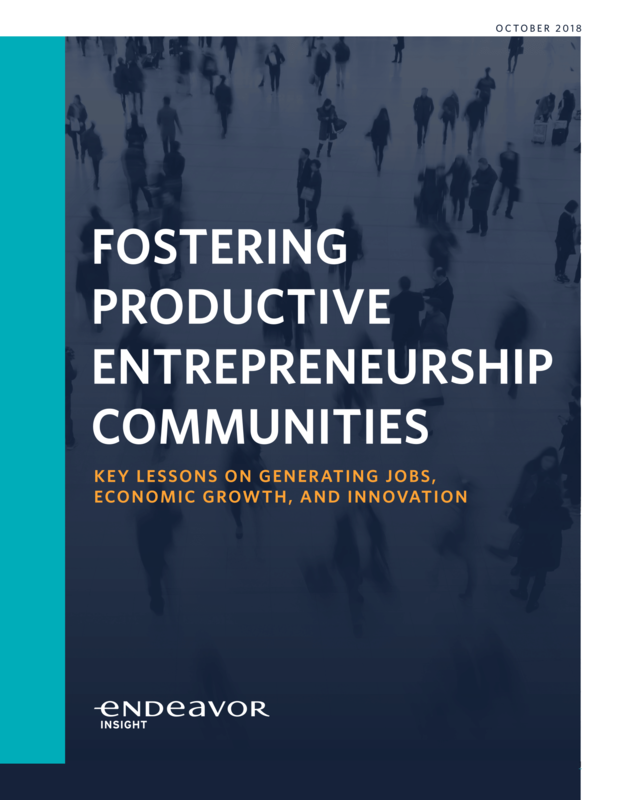 Endeavor Insight recently completed one of the largest studies ever conducted on entrepreneurship communities. This research was funded by the Bill & Melinda Gates Foundation in order to answer the following question: How can decision makers empower local entrepreneurship communities to become more productive? This project is one of the first studies to use network analyses to assess the collective impact of founders, investors, support organizations, and other entrepreneurship actors. You can learn more and download the full report here. This report depicts the landscape of development organizations that fund and support small and medium enterprises (SMEs) in developing countries: 1) multilateral development banks, 2) bilateral government donor agencies, and 3) development finance institutions (DFIs). The report is a new contribution to both the development community, as well as the Aspen Network of Development Entrepreneurs (ANDE). Advocacy and policy work is a strategic priority for ANDE, and the report's findings will enable the Network to understand the international development community and to be more strategic in its approach as it seeks to influence and shape the international development SME agenda. The expansion of the mobile industry across developing and emerging markets enables a number of social and economic opportunities. In addition to the benefits that mobile technology provides, mobile network operators (MNOs) themselves can offer many opportunities for basic employment and entrepreneurial activity. Some women have been able to benefit from these opportunities, while many others remain marginalized. In this report, we investigate the gender composition of the ‘mobile value chain’ (MVC) in 11 different markets around the world. We examine the current level of women’s participation in the MVC and the benefits of such participation both for MNOs and for women entrepreneurs. In addition to undertaking an analysis of the MVC, we broadened our scope to encompass the wider political, social and institutional conditions in each market. We interviewed policy makers and spoke to other stakeholders who have an interest in women’s economic empowerment in the markets concerned. This publication represents a framework for thinking about the role government policy can play in creating an enabling environment for impact investing. This framework is based on, and illustrated by, 16 individual policies in 13 countries. The following document represents a significant contribution to our thinking about impact investing policy, but it is only the departure point for a conversation that must necessarily become more concrete as it finds application in specific impact objectives, sectors and geographies. We look forward to working with IRI, InSight and other partners to refine the framework and use it as a basis for additional research and policy proposals to unlock impact investment. Standard Chartered commissioned this report to gain an understanding of its economic impact in Ghana. the bank believes it should contribute directly to the economies in which it operates. to this end, it hopes this report will help to inform its future strategy, in Ghana and elsewhere.